It is said that Goa Lawah was made with the appeal of the priest from Java called empu Kuturan at the beginning of the 11th century. Goa=cave and Lawah=bat, so as it means, thousands of bats hang down from the cave ceiling and fly around. In addition, women who are in menstruation or breast feeding to children are prohibited to enter all temples in Bali. Bat Cave Temple….It seemed like the scary thing. 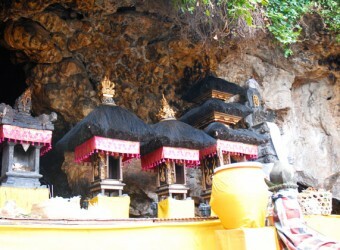 The guide told me that it is said this cave is going through Besakih Temple. Really? Bat smell near the cave, I didn’t want to so close to the cave. I didn’t see many bats here, however it is said that bats come out from the cave when it gets dark. It was god to go in the daytime!